As a youth who grew up in this culture and as a person who received a minimum education, I wonder about those individuals and countries that grovel at the feet of the rich and powerful just to be fed. In 2015, international humanitarian assistance went to 145 countries, and Eritrea was not on the list (GHA 2017: 58). According to the report, the 10 largest recipients of international humanitarian assistance were Syria, Yemen, Jordan, Iraq, Palestine, Lebanon, South Sudan, the Democratic Republic of the Congo, Ethiopia, and Nepal. If you look at the top 10 recipients of foreign assistance, it is quickly apparent that these states are fragile. During the same year (2015-16), Eritrea faced the same drought-like conditions as neighboring countries, as well as the illegal military attack by Ethiopia at Tsorona. However, the Government of the State of Eritrea, understanding its responsibility, responded quickly in order to meet the needs of its people and avert disaster – without the resort to large amounts of foreign international assistance. In many ways, this should be admired. The foreign aid cycle and culture of dependency often leaves African countries more debt laden, more corruption prone, and more vulnerable and fragile. The attitude of reliance on others is a central source of abasement to the national and continental pride of Africa. Frequently, for the donors, providing aid is not an act of altruistic charity, but rather a form of conditionality or reflection of hierarchical power imbalances. Aid often undermines the sovereignty of recipient states. Fanon tells us not to regard aid as charity. He maintains that “when we hear the head of a developed nation declare with hand on heart that he must come to the aid of the unfortunate people of the underdeveloped world, we do not tremble with gratitude. On the contrary, we say among ourselves, ‘it is just reparations we are getting.’ So we will not accept aid for the underdeveloped countries as ‘charity’” (2004: 59). The history of Eritrea is based on the trust of internal instincts and judgments on what it seems right to the Eritrean cause. In the past, the certainty within our spirit made the dream of independence a reality. Starting from our revolution, self-reliance has become the gospel of Eritrea. The people of Eritrea paid unparalleled sacrifice for the promotion of self-reliance, independence, and development. The Holy Bible tells us that “but many who are first will be last, and the last first” (Matt 19: 30). We saw societies who got into “first” with the help of external support and are now paralyzed – so much so that they lag behind and beg formercy from others. Reliance on others – “other reliance” – is a virus that brings a demoralizing malady of helplessness and perpetuates underdevelopment. The history of Eritrea tells all healthy minded and considerate people a valuable fact that if you believe in self-reliance then with perseverance and endurance you can survive any adversity. Courage, perseverance, self-reliance, and decisiveness are the main traits that define Eritreans. We know very well that nobody can bring you change. With this knowledge we do not permit anyone to tell us our business. The weak-spirited within the international system, who lost their confidence and tolerance and are addicted tomeddling in others’ affairs, have worked hard to kill the strong spirit of Eritrea. The formula is clear: those who are weak in spirit, desire to make others weaker. Aid that does not promote development undermines the idea of self-reliance and has killed the hopes of millions. Self-reliance has elevated national pride to a higher status. Eritrea’s present and future is up to Eritreans. No more, no less. The reason for our sacrifice was to stand on our own two feet with confidence and pride. Eritrea is built by Eritreans with Eritrean blood coursing in their veins and Eritrean spirit blowing in their minds. Social justice and self-reliance have given Eritrea a clear sense of direction and offered a positive response to the question of whether self-reliance is necessary for the country’s social and economic development. In Eritrea, self-reliance is not a policy directive imposed by policymakers. Rather, it is, along with hard work, the foremost cultural component that shapes our society. At the individual level, hard work is perceived by Eritreans as the true means of achieving economic independence and satisfaction. “A slack hand causes poverty, but the hand of the diligent makes one rich,” “the hand of the diligent will rule,” and “abeggar wears like a shoe,” are among the many traditional proverbs in Eritrean society. To be a self-reliant country in a continent plagued by the virus of “other reliance” is what makes Eritrea a target of various forms of accusations and assaults. The objective of the various military, political and economic assaults against Eritrea is to punish the country for the “crime” of the rejection of subservience. The refusal (led by the US) to lift the unjust sanctions imposed on Eritrea, despite the ongoing calls for their removal and the lack of any rational for their continuity, are the cost that the country must bear for its independent path. Eritrea is not a destabilizing force or terrorist threat. Rather, its pursuit of self-reliance – and the potential reverberations this may have on the region – is the real threat that Eritrea poses to the “other reliance” system of hegemony designed mainly by certain global powers. Many people in the world live under unacceptable conditions of poverty and have lost their individual shame and national pride. Tazoacha Francis, when explaining poverty, said “Poverty is the oldest and the most resistant virus that brings about a devastating disease in the third world called underdevelopment. Its rate of killing cannot be compared to any disease from the genesis of mankind. It is worse than malaria and HIV/ AIDS which are claimed to be the highest killer diseases.” Yes, there are many definitions of poverty. According to the UNHD Report, poverty is defined as a “complex phenomenon that generally refers to inadequacy of resources and deprivation of choices that would enable people to enjoy decent living conditions.” Importantly, Tazoacha Francis tells us the root cause of poverty “is not a person’s unwillingness to work, his inability to work, lack of resources to put together or lack of skills… [Rather] he/she shoulders the yoke of poverty because he/she does not receive the full worth of his work and his rights in the society.” Indeed. In Eritrea, every able-bodied citizen is engaging tirelessly for the promotion of the national development projects. For certain reasons, some contend that in contrast to the work we do, our income and material possessions are not sufficient. Nevertheless, every Eritrean is entitled equally to the right to education and health, the right to participate in all the development efforts, the right to be protected and many other human rights relating to the fulfillment of basic human needs. Those rights have given a chance to every Eritrean to be able to participate, with dignity, in societal endeavors. Hunger, malnutrition, illiteracy, illness from preventive diseases, marginalization, abbreviated life span, lack of access to services or infrastructure, and other poverty-related concerns have been seriously addressed, although they are not eradicated from the face of Eritrea. The political will and commitment of the government to alleviate the multi-dimensional plight of poverty is strong. Many developing countries have become a testing ground for aid as a means to alleviate poverty and a new source of hope for development. The lesson that we can obtain from history is, however that there is no certain correlation between aid and development. President Isaias Afwerki once explained the pitfalls of aid, and suggested that “Aid’s overall effectiveness has been substantially eroded by the flaws in its structure and by the innumerable conditions, rules, and procedures imposed by donor nations.” Aid is not a tablet manufactured to cure the disease of underdevelopment and to bring improvement. Aid packages arriving with an appalling number of strings attached have few benefits except to create a confusion of priorities upon the recipient. Development is a historic process that takes place over a long period of time. Development is a deliberate and concrete effort made by the people and for the people to change things for the better. Aid is simply the transfer of resources from one place to another place for immediate relief. Quite often, it doesn’t contribute to long-term development. For many, aid is a power mechanism devised by developed countries to sustain the poverty of the poor by inculcating dependency and “other reliance.” Regarding the subtle harm of dependency, Fanon said the issue is not whether an African region is under French or Belgian sovereignty but whether the economic zones are safeguarded. Artillery shelling and scorched earth policy have been replaced by an economic dependency” (Fanon 2004: 27). The necessary requirement to eradicate poverty lies not in aid but a change in priorities and thinking of the people. Aid is a futile attempt at addressing the symptoms without addressing the root causes of poverty. Therefore self-reliance is an essential ingredient in any poverty alleviation and development programs. Internal forces play a dominant role in determining the prospects of development. Throughout much of the developing world, countries receiving external aid have failed to bring sustainable peace or development. Often the biggest beneficiaries have been the corrupt local elite. The common people have frequently gained little to nothing. It is quite telling that despite formal independence for many countries, citizens continue to demand independence, this time from the shackles of dependence. What is the point of being independent if you are still dependent on the mercy of others? Fanon, in his book Toward the African Revolution (1967), argues that “colonialism and its derivatives do not as a matter of fact constitute the present enemies of Africa…the great danger that threatens Africa is the absence of ideology” (Fanon, 1967: 86). Africa needs a liberating ideology that paves the way to inner capabilities. In this case, the experience of Eritrea can serve as a starting point of reference for self-reliance and cooperation based on mutual interdependence. Self -reliance urges the people to strive and pursue various means to gain the desired objective. It further obliges the people and the government to work hand in glove to bring about general good. It reminds both the people and the leadership that the responsibility of development is up to themselves. Self-reliance offers a therapy for the multi-dimensional menace of poverty. It also empowers the poor to regain confidence and hope to develop through their own efforts. In order for self-reliance to be inculcated deep into the minds of the people, especially the young generation, we must work diligently to increase awareness. Our educational system, from kindergarten to college, has to teach the concept of self-reliance and instruct learners to construct a bridge that connects self-reliance with that of developing Eritrea. Religious institutions, too, have to inform their adherents about the sacred nature of self-reliance and hard work. 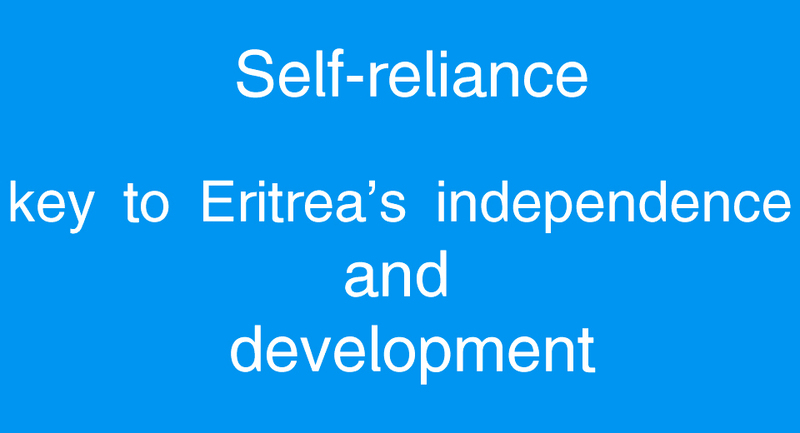 Self-reliance is the key to Eritrea’s independence and development. The righteousness and the justness of our position and self-reliance give us strength and courage to stand proudly amongst the countries of the region and the world. oil merchants, ship owners, merchants’ representatives and lawyers. Imposing tittles such as defender of the Islamic advance, ornament of the religion, invigorator of justice in the world and sultan magnificent were awarded to the sultans. According to Puglisi, the ancient cisterns in Dahlak were built in the 7th-8th Century AD during the maritime expansions of Persians from Sirfa to provide water for African slaves traded in Egypt, in the Arabian Peninsula and the Gulf of India. In the 18th century, Bruce confirmed that he had seen 360 cisterns at Dahlak Kebir. In 1946, Puglisi recorded 70 cisterns in the village of Dahlak Kebir and 30 in Adal. The 365 cisterns are all over the flat open land of the islands. Many can be seen between the villages of Derbishet and Kebir. Most of the wells have tunnel like structure for collecting and directing running water after rain. According to historical facts and oral traditions, it was for the exclusive use of a Sultan (leader). The technique of making such kind of water installation method is one of the peculiar evidences of the ancient water conservation management strategy in the world. At the end of the 19th century, the Italians found little interest in the islands. The remoteness and blazing heat made them an ideal, if merciless, location for penal institution, a trend that the Italians started at the end of the19thC. Nakura, which is situated west of Dahlak Kebir, was established as a detention camp for the anti-colonial Eritrean patriots. Likewise, under the Derg regime, it was used as a detention centre for political prisoners. Finally, the archipelago could offer an ideal opportunity for tourism and has potential for UNESCO world heritage list based on its mixture of rich archaeological, historical and natural heritage. It remains equally significant to safeguard the heritage of the archipelago as part of the national development programs and raise awareness of the surrounding community.